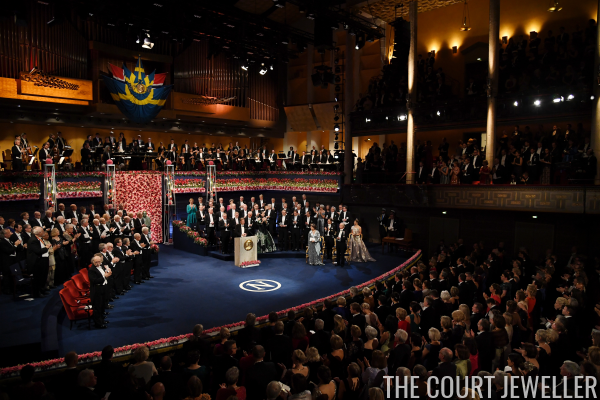 The Nobel celebrations were still going strong in Stockholm on Sunday, and we got even more tiaras and jewels at the annual King's Dinner! Here's a look at the glitter on display. With her red gown, Queen Silvia wore Queen Sofia's Tiara (aka the "Nine Prong"), a diamond riviere with a pendant drop, the Karl Johan Earrings, and the family's diamond and ruby cluster brooch. Crown Princess Victoria wore the Boucheron Laurel Wreath Tiara (a piece she now owns personally, having inherited it from the late Princess Lilian). She also accessorized her Jenny Packham gown with diamond earrings and a diamond rosette brooch from the family collection. Princess Madeleine wore not one but two tiaras for the dinner! On her head, she wore the Modern Fringe Tiara; around her neck, she wore the Connaught Diamond Tiara in its necklace form. (I think it gets lost a bit in the dress, unfortunately.) She's also wearing the Vasa Earrings and the family's diamond bow brooch. And, drumroll: it's another new tiara for Princess Sofia! She wore the Diamond Four Button Tiara with the small diamond earrings that came from Queen Josefina's diamond stomacher. She's also wearing the same diamond brooch she wore at Saturday's ceremony and banquet.